“The roof lines and the stone work give it an intimate, cottage feel,” says Bruce Olson, who built the estate. “That’s also present in the interior; we tried to make all the spaces cozy. 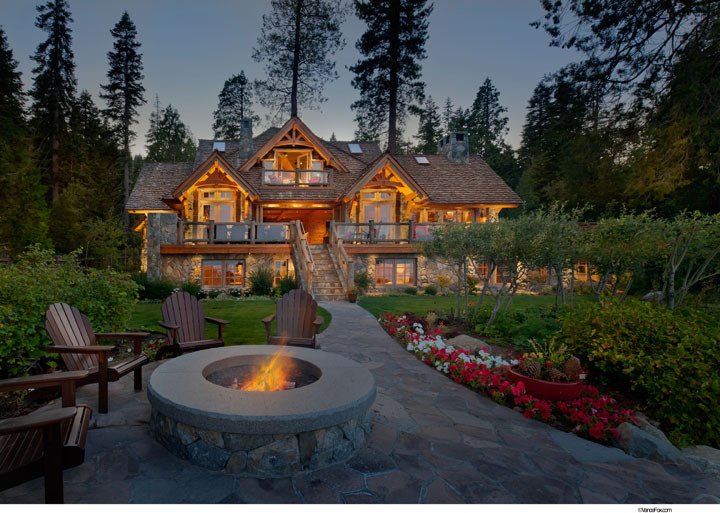 It’s an old Tahoe design with modern amenities.”The home, owned by Cindy and Jerry Johnston, was almost much cozier. Originally the Johnstons bought a 50-foot-long lakeshore property and approached Tahoe City’s Olson-Olson Architects (OOA) to design a home for that size. Later they acquired the adjoining parcel for a total of 100 feet of lake- shore with which to work. A house on that adjoining parcel was moved down the street, and the owners had what they wanted—a space to build a legacy home that they intend to have in their family for generations.